I am working right now on a dissertation chapter on spectacle in Hausa films and currently on the “music video” portion of it. I actually had to come to my blog to find one of the songs I wanted to look at, as it seems to have mysteriously disappeared from my computer. Here it is. The cinematography is rather boring, but the song (seen alongside the film) is brilliant. In the meantime, Weekly Trust did not post my column on my WT page this week for some reason, so at the request of Twitter followers, I am posting it here on my blog. 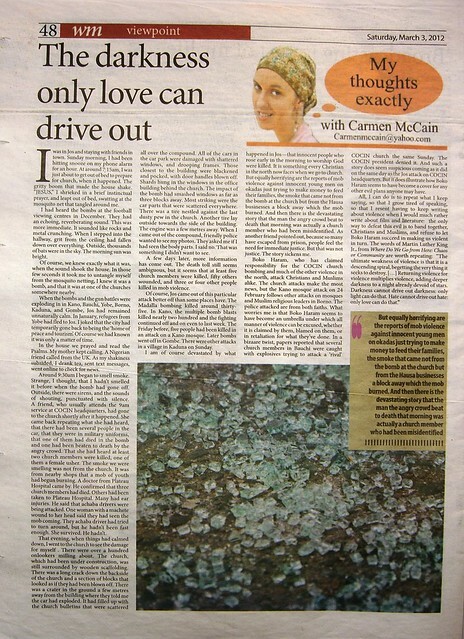 It has actually been three years since I started my column in Weekly Trust, and, though I have sometimes turned in late, sleep deprived and occasionally incoherent articles that I am less than proud of, I have actually never missed a week since I started–even when deathly ill! So, if you check my Weekly Trust page and something is missing, get in touch with me and I will try to post it on this blog. This week was kind of an index to what I have written this year, which may be why WT didn’t post it. I will include links below, so that if you missed reading something this year, you can find it here. Last week marked the third anniversary of this column “My Thoughts Exactly,” which I began writing on 16 October 2010. Last year, in my second year review, I wrote that I planned “to take a slightly more scholarly turn in the upcoming year while I finish writing my PhD dissertation.” I’m not sure if this year was more scholarly, but it did become more literary, as I focused more on reading, libraries, and a lot of book reviews. 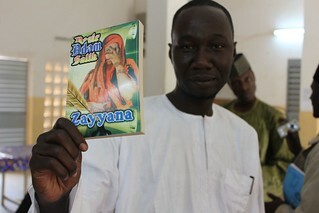 Balaraba Ramat Yakubu’s novel Wa Zai Auri Jahila? Auri Jahila? which has not been translated, but, if the letters I received are any indication, is one of her readers’ favourites. 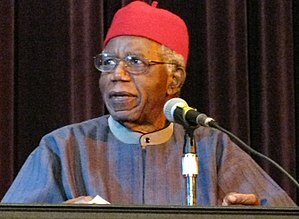 I also examined the politics surrounding the reception of northern Nigerian and Hausa literature in a piece that reviewed the 7th conference on Northern Nigerian Literature at Bayero University in December 2012 and a celebration held the next weekend for Hausa literary critic and translator Ibrahim Malumfashi. 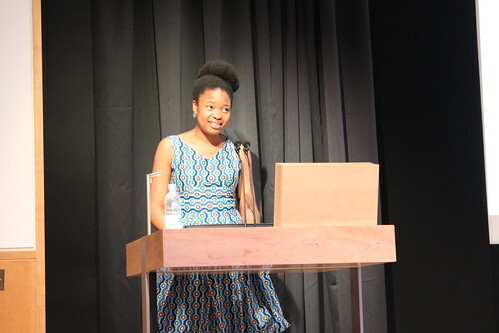 Later, I reviewed the October 2013 issue of the online translation journal Words Without Borders, which focused on translations of works by African women writing in African languages and included Professor Malumfashi’s translation of the first chapter of Rahma Abdul Majid’s novel Mace Mutum. I wrote one piece on my vacation reading over Christmas 2012, and another topical review looked at the performance of three Nigerian plays, a workshop performance Banana Talks, Femi Osofisan’s play Midnight Hotel, and Wale Ogunyemi’s play Queen Amina of Zazzau, during the 7th Jos Festival of Theatre by the Jos Repertory Theatre. novel about race and class in America and Nigeria, Americanah; Chibundu Onozu’s romantic thriller The Spider King’s Daughter, and Zimbabwean author NoViolet Bulawayo’s brilliant, multi-layered novel We Need New Names. I also interviewed novelist Nkem Ivara about her romance novel Closer than a Brother. 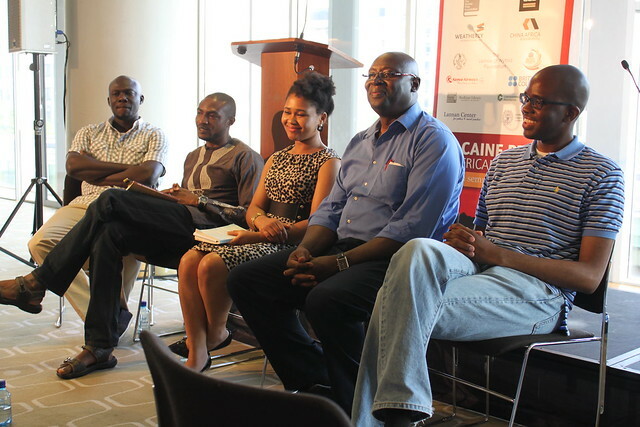 Inspired Us, by Young Writers”–my paragraph was pulled, with my permission, from my Facebook page] and the tragic murder of Ghanaian poet Kofi Awoonor in the September 2013 Westgate Mall terrorist attacks in Nairobi. Another tragedy for readers was the suicide of intellectual activist Aaron Schwartz, who had been persecuted by courts in the U.S. for trying to make scholarly materials free and available online. I often receive emails from readers asking where they can find the books I’ve reviewed. While I often direct them to bookstores in Abuja and Lagos, and online stores like jumia.com, konga.com, and mamuwa.com, I also explored literary resources available online [which WT didn’t post online and I haven’t yet uploaded the hard copy to flickr–I’ll try to do that soon] and addressed the need for better library resources, whereby people who don’t have the money to buy sometimes outrageously-priced books can read them by borrowing. The secretary of Jos Association of Nigerian Authors Onotu David Onimisi told me in an interview (see part 1 and part 2) about the ANA project to develop a community library in Jos. He directed me to the excellent American Corner library in Jos which is open to the public and is currently hosting the ANA library while they build another location. I also interviewed Kinsley Sintim who during his NYSC youth service started a community library in Tasha outside of Abuja and has been able to get a massive number of donated books for children in the community. (See Part 1, Part 2, and Part 3. I really should have edited it down to just two parts, but I was travelling….] For a comparative perspective, I interviewed an old college classmate Elizabeth Chase, who is a senior librarian at a library in Frisco, Texas. I shared some of the feedback I’ve received about my “literary pieces,” in an August readers column. A few of my topical pieces were “Christmas in the Age of Massacres” and a piece that reviewed “The Good Things of 2012” in what was an otherwise very sobering year. Last November, I questioned Christian Association of Nigeria president Ayo Oritsejafor’s acceptance of a private jet as a gift from his church, pointing to scriptures that challenge the accumulation of earthly wealth. My review of Balaraba Ramat Yakubu’s Wa Zai Auri Jahila? was a response to the child marriage controversy sparked off by Senator Ahmad Sani Yerima’s insistence that puberty should be the only determining factor in marriage age. “Weeping at Night, Waiting for Light” before Palm Sunday addressed the bomb in the Kano car park and attacks on schools and a church in Borno and Kano. Most recently I have written about the parallel terror attacks on Benisheik, Baghdad, Nairobi, and Peshawar, and the attack on the College of Agriculture in Gujba. this year: Hausa film director Balarabe Sango, who passed away in December 2012, and an old schoolmate Dr. Rachel Horlings, one of only three underwater archeologists working off the coast of West Africa, who was killed in Elmina, Ghana in a freak electrical accident. In “As the Rains Begin” I linked tragedies to the rhythmic seasonal motion of the earth, celebrating the birth of a baby born to a friend who lost her husband the year before. I was fortunate to host several guest columns this year. Dr. K.A. Korb, currently Head of the Department of General and Applied Psychology at the University of Jos, contributed three pieces, one challenging the perception that teaching is a last resort career by interviewing several dedicated and passionate teachers. She also contributed a two-week column on post traumatic stress disorder and the effects that it is having on people in northern Nigeria. Egyptian writer and journalist Nadia Elawady allowed me to reproduce her piece linking the Boston bombing to the tragic events unfolding in Egypt [here is the WT link, and here is her original piece on her blog). Scholar Hannah Hoechner, who has done research with almajirai in Kano, responded to the proposed ban on almajiranci in Kano. Thank you for reading this year. If you missed any of these pieces or want to read any of them again, you can find most of them under the “My Thoughts Exactly” tab on the Weekly Trust website. I am trying to push through to the end of my PhD dissertation this year, so I will likely continue to feature guest columns and more “academic” material as I try to close this chapter of my life. I love receiving emails from readers, so please keep sending your feedback. Thank you. Before I send it off to Elnathan, I crack it open curiously, read a chapter before I go to bed. The next morning I wake up and open it again. I read greedily. The way I used to when I was in high school with my science fiction and fantasy. The way I read when I would neglect my homework, come home with a novel, which I would finish before I would start my homework late at night, working on my bed far into the night with a candle. I would fall asleep, my head inches from the candle balanced on a plate, sometimes not yet done with the algebra, which I would try to hurriedly finish in shaky pencil in the car on the way to school the next morning. Those days, I poured the stories into me. Every day a new novel. Greedily. In grad school, I began to read more slowly, pencil in hand. I read theory and criticism, and long academic papers that I printed from the Internet. It was no longer a joy to read. I stopped reading. I became addicted to the Internet. In grad school when trying to finish my MA thesis, I started a blog. It was such a relief to have that outlet–to write my thoughts effortlessly in that forum when I was so stuck with academic writing. Then Facebook came along, and I became doubly addicted—to the inane games, the well-turned status update, the latest news–link upon link upon link. I am two days late on an academic paper deadline, and yet I am sitting here in an office chair in my parent’s spare room, sitting at the desk in front of my computer, reading shamelessly–even when my mother comes in, the computer screen dead–reading Wainaina like a science fiction novel. It is not what I am supposed to be doing. It is not work. It is pleasure. Wainaina’s musings awaken in me memories of my own life, of the daydreams at fifteen, when I would stare dreamily out the windows of our van at the misty mountains of the green plateau in rainy season and imagine fantasy novels about a shepherdess name Merrony tending flocks on a long sunflower strewn Plateau. It was to be a trilogy. I can still remember the story now, as if it were a novel I had read long ago, a novel that will always remain in that “to-be-written” stage. My preoccupations have moved past Merrony, but Wainaina makes me want to write again in that way. When I planned to write a review of Wainaina’s memoir for my column, I thought at first maybe I’d write something stream of consciousness. What I’ve copied above was the beginning of my brainstorm. But it felt too self-indulgent for the Weekly Trust. I let it be a blog post. Instead, I decided to focus on the parts of the memoir that seemed the most strikingly relevant to Nigeria right now. I can’t find the hard copy of the article, but if you scroll down below or click on this link, you can read what I wrote. having read a couple of his sardonic essays and interviews, I admit that the lilting dreaminess, even sweetness, of his memoir came as a surprise. If “How to Write About Africa” bitingly mocks how foreign reporters or celebrity activists write about Africa as if Africans had “no conflicts or resolutions in their stories, no depth or quirks” then Wainaina’s memoir explores the depths and quirks through the remembered details of his own life. Following his Caine prize win, the memoir becomes more travelogue of the African countries he visits on writing business, impressions of Lagos, Lome, Accra; Kenyan election violence; African news browsed for on the internet, the writing life in America’s cold winter, where he is now director of the Chinua Achebe Centre for African Writers and Artists at Bard College. What struck me most in this sprawling account of family and personal history was the reoccurring motif of the ambiguity of borders, the way people change personalities as they switch languages, the shifting identities of ethnicity and naming that languages bring, how they include and exclude. Wainaina grew up in Nairobi, son of a Ugandan Bufumbira mother and a Kenyan Gikuyu father, speaking Swahili and English. 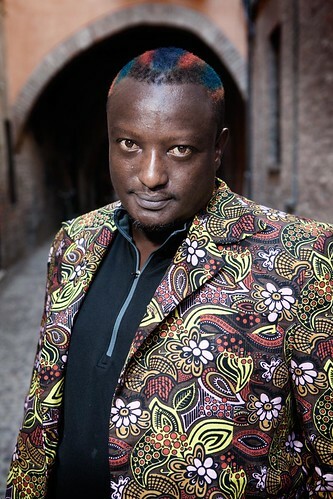 Following Gikuyu tradition, he, as second son, was named after his maternal Ugandan grandfather, Binyavanga, a Bufumbira nickname that means “mixed up”. His name becomes an appropriate lens through which to read his memoir. In his travels around Africa, Wainaina’s observes, along with delightful new quirks of national character, similar discrimination over language, class and ethnicity. Towards the end of the book, he writes in a fog of horror about the Kenyan election violence of 2007-2008. Yet the mixed-up nature of his own family background points to relationships of familiarity possible all over the continent. When, a kind South African friend hires Wainaina, at his most destitute, as a marketer, he remembers in a rush of warmth other acts of compassion: how another South African friend “offered to let me stay rent free in her house” and how her “father, a physics professor […] left South Africa in the fifties unable to get a job in Verwoerd South Africa [… but] was adopted in Nigeria where they lived for many years, […teaching] a generation of Nigerian physicists at Ibadan.” “This is how to become an African,” he writes. The “place” Wainaina writes about is both his mother’s hometown and the continent he travels: His family history is one of blood and one of adoption by friends throughout Africa. This is how to write about Africa, he implies. This is how to write about this place. compound. There was a tire lodged into the back pew of the church. There was an engine somewhere else and another tire that went around the side, the fusilage elsewhere. There was what looked like an orange plastic water tank that seemed to have been torn apart. Apparently earlier in the day, the bombers body parts were also strewn around, but fortunately, I did not see that. The other notable thing was that windows as far as a 2-3 blocks away were blown out. All of the cars in the parking lot outside of the church had their windows blown out and a few of the ones closest to the church were blackened and a little melted from the blast. The windows in the 4-5 story COCIN headquarters office building were mostly blown out. There was shattered glass everywhere. […] As far as casualties, I’m not sure, but what I heard earlier in the day was that 3 church members died on the spot, and 3 more died in the hospital later. There could be more, but I don’t have any way to verify that. It took me until the next Sunday to walk around in the neighborhood near the church and realize the extent of damage that had been done in reprisal violence. The fruit sellers in front of the First Bank down the street from the church told me that they heard the blast and saw the dust cloud. When the mob ran down the street, they ran away, and the mob burnt or looted all their merchandise. The mob also burnt a Muslim owned restaurant and other shops in the area. I went to give my condolences to the men selling spare parts across from the Mobile station in that area, and he told me that the morning of the bomb they had been at the house down the street where some Muslim women have a business selling masa and miya every morning in front of their house, waiting for the ladies to finish frying the masa for breakfast. When the bomb went off, a mob came and they all ran away. Not only did the mob burn all the businesses around but they also burned down the house of the women who sold the masa and miya every morning. I had bought food from them before, and I knew most of the Hausa business people in the area. This I think is when the devastation really hit home to me–the bomb was bad enough, but then the human desire for retaliation resulted in far more innocent people suffering. Before reading my article “The Darkness only Love can Drive out” (to read the hard copy click on the photo below, or scroll down for a blog version with links), if you are interested in reading the stories of some of the other victims, here is the sad story of Hajara, who fled Boko Haram in Yobe only to be killed in the Jos COCIN church bombing, and Grace, a Sunday School teacher. Her family tell of how she was born prematurely and they see the years they had with her as God’s blessing. I was in Jos and staying with friends in town. Sunday morning, I had been hitting snooze on my phone alarm for an hour. At around 7:15am, I was just about to get out of bed to prepare for church, when it happened. The gritty boom that made the house shake. “JESUS,” I shrieked in a brief instinctual prayer, and leapt out of bed, swatting at the mosquito net that tangled around me. I had heard the bombs at the football viewing centres in December. They had an echoing, reverberating sound. This was more immediate. It sounded like rocks and metal crunching. When I stepped into the hallway, grit from the ceiling had fallen down over everything. Outside, thousands of bats were in the sky. The morning sun was bright. Of course, we knew exactly what it was, when the sound shook the house. In those few seconds it took me to untangle myself from the mosquito netting, I knew it was a bomb, and that it was at one of the churches somewhere nearby. When the bombs and the gun battles were exploding in in Kano, Bauchi, Yobe, Borno, Kaduna, and Gombe, Jos had remained unnaturally calm. 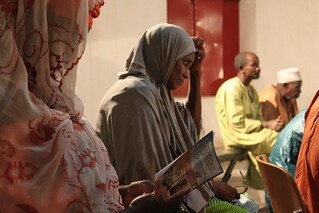 In January, refugees from Yobe had fled to Jos. I joked that the city had temporarily gone back to being the ‘home of peace and tourism’. Of course we had known it was only a matter of time. In the house we prayed and read the Psalms. My mother kept calling. 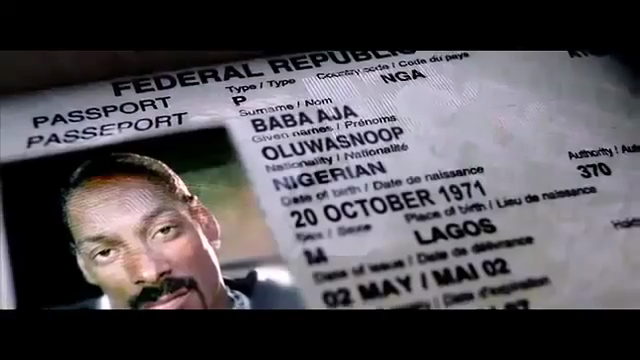 A Nigerian friend called from the UK. As my shakiness subsided, I drank tea, sent text messages, went online to check for news. Around 9:30am I began to smell smoke. Strange, I thought, that I hadn’t smelled it before when the bomb had gone off. Outside, there were sirens, and the sounds of shouting, punctuated with silence. A friend, who usually attends the 9am service at COCIN headquarters, had gone to the church shortly after it happened. She came back repeating what she had heard, that there had been several people in the car, that they were in military uniforms, that one of them had died in the bomb and one had been beaten to death by the angry crowd. That she had heard at least two church members were killed, one of them a female usher. The smoke we were smelling was not from the church. It was from nearby shops that a mob of youth had begun burning. A doctor from Plateau Hospital came by. He confirmed that three church members had died. 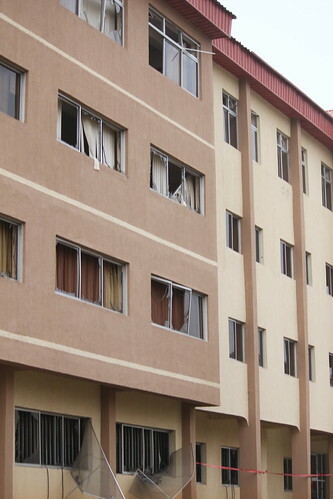 Others had been taken to Plateau Hospital. Many had ear injuries. He said that achaba drivers were being attacked. One woman with a machete wound to her head said they had seen the mob coming. They achaba driver had tried to turn around, but he hadn’t been fast enough. She survived. He hadn’t. That evening, when things had calmed down, I went to the church to see the damage for myself . There were over a hundred onlookers milling about. The church, which had been under construction, was still surrounded by wooden scaffolding. There was a long crack down the backside of the church and a section of blocks that looked as if they had been blown off. There was a crater in the ground a few metres away from the building where they told me the car had exploded. 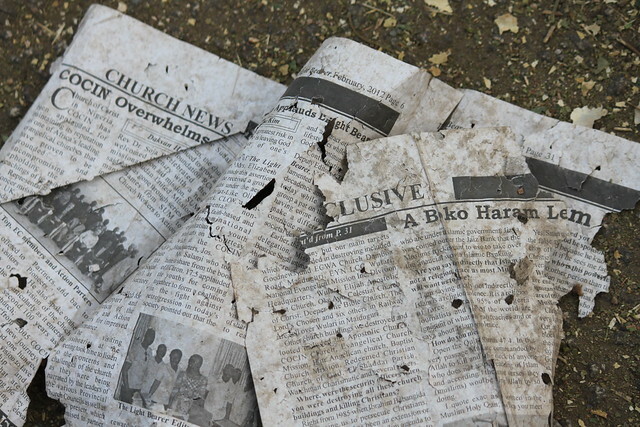 It had filled up with the church bulletins that were scattered all over the compound. All of the cars in the car park were damaged with shattered windows, and drooping frames. Those closest to the building were blackened and pocked, with door handles blown off. Shards hung in the windows in the office building behind the church. The impact of the bomb had smashed windows as far as three blocks away. Most striking were the car parts that were scattered everywhere. There was a tire nestled against the last dusty pew in the church. Another tire lay outside towards the side of the building. The engine was a few metres away. When I came out of the compound, friendly police wanted to see my photos. They asked me if I had seen the body parts. I said no. That was something I didn’t want to see. A few days later, more information has come out. The death toll still seems ambiguous, but it seems that at least five church members were killed, fifty others wounded, and three or four other people killed in mob violence. Of course, Jos came out of this particular attack better off than some places have. The Madalla bombing killed around thirty-five. 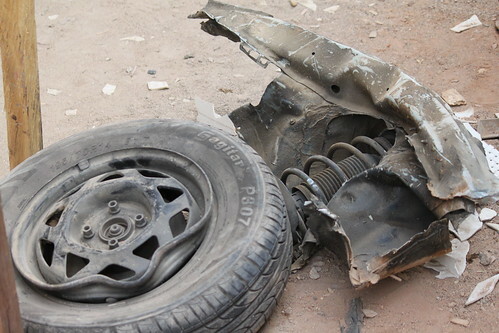 In Kano, the multiple bomb blasts killed nearly two hundred and the fighting continued off and on even to last week. 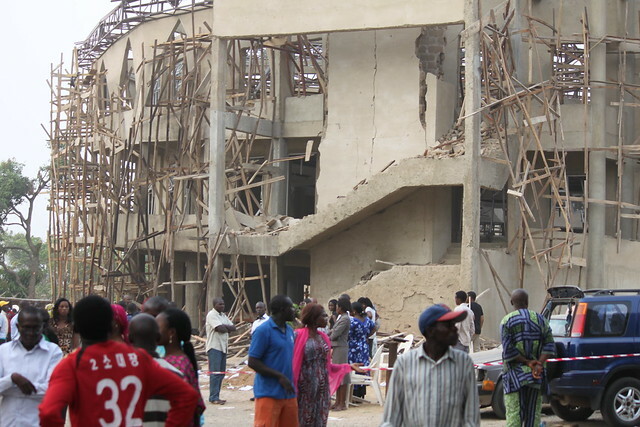 The Friday before, five people had been killed in an attack on a Kano mosque. 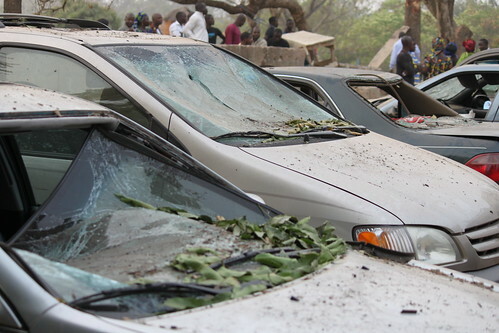 Later bombs went off in Gombe. There were other attacks in a village in Kaduna on Sunday. I am of course devastated by what happened in Jos—that innocent people who rose early in the morning to worship God were killed. It is something every Christian in the north now faces when we go to church. But equally horrifying are the reports of mob violence against innocent young men on okadas just trying to make money to feed their families, the smoke that came not from the bomb at the church but from the Hausa businesses a block away which the mob burned. And then there is the devastating story that the man the angry crowd beat to death that morning was actually a church member who had been misidentified. As another friend pointed out, because so many have escaped from prison, people feel the need for immediate justice. But that was not justice. The story sickens me. Boko Haram, who has claimed responsibility for the COCIN church bombing and much of the other violence in the north, attack Christians and Muslims alike. The church attacks make the most news, but the Kano mosque attack on 24 February follows other attacks on mosques and Muslim religious leaders in Borno. [This UN publication, published 20 January 2012, gives a partial timeline of Boko Haram attacks.] The police attacked are from both faiths. What worries me is that Boko Haram seems to have become an umbrella under which all manner of violence can be excused, whether it is claimed by them, blamed on them, or in retaliation for what they’ve done. In a bizaare twist, papers (see Tribune ) reported that several church members in Bauchi were caught with explosives trying to attack a ‘rival’ COCIN church the same Sunday. The COCIN president denied it. And such a story does seem suspicious coming as it did on the same day as the Jos attack on COCIN headquarters. [The story has since been confirmed]. But it does illustrate how Boko Haram seems to have become a cover for any other evil plans anyone may have. 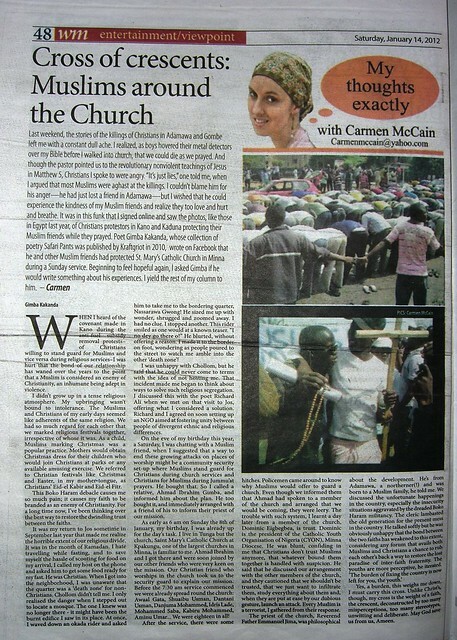 On 14 January 2012, the poet Gimba Kakanda, one of the brains behind the active “Nation-wide Anti-Fuel Subsidy Removal” group on Facebook, wrote a guest article for my Weekly Trust column about his experiences organizing a group of Muslim youth in Minna to protect a church the Sunday before: “Cross of Crescents: Muslims around a Church”. To read his thoughtful and provocative piece, click on the link, click on the photo below, or scroll down to read here on my blog. 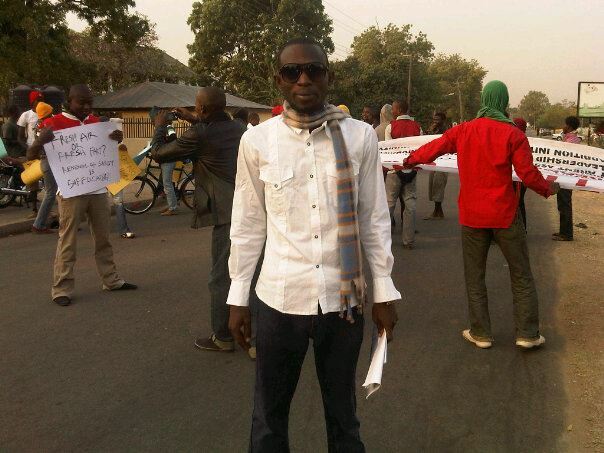 Last weekend, the stories of the killings of Christians in Adamawa and Gombe left me with a constant dull ache. I realized, as boys hovered their metal detectors over my Bible before I walked into church, that we could die as we prayed. And though the pastor pointed us to the revolutionary nonviolent teachings of Jesus in Matthew 5, Christians I spoke to were angry. “It’s just lies,” one told me, when I argued that most Muslims were aghast at the killings. I couldn’t blame him for his anger—he had just lost a friend in Adamawa—but I wished that he could experience the kindness of my Muslim friends and realize they too love and hurt and breathe. It was in this funk that I signed online and saw the photos, like those in Egypt last year, of Christians protesters in Kano and Kaduna protecting their Muslim friends while they prayed. When I heard of the covenant made in Kano during the anti-fuel subsidy removal protests–of Christians willing to stand guard for Muslims and vice versa during religious services–I was hurt that the bond of our relationship has waned over the years to the point that a Muslim is considered an enemy of Christianity, an inhumane being adept in violence. I didn’t grow up in a tense religious atmosphere. My upbringing wasn’t bound to intolerance. The Muslims and Christians of my early days seemed like adherents of the same religion. We had so much regard for each other that we marked religious festivals together, irrespective of whose it was. As a child, Muslims marking Christmas was a popular practice. Mothers would obtain Christmas dress for their children who would join Christians at parks or any available amusing exercise. We referred to Christian festivals like Christmas and Easter, in my mother-tongue, as Christians’ Eid-el Kabir and Eid-el Fitr. This Boko Haram debacle causes me so much pain; it causes my faith to be branded as an enemy of Christianity. For a long time now, I’ve been thinking over the best way to restore the dwindling trust between the faiths. It was my return to Jos sometime in September last year that made me realize the horrible extent of our religious divide. It was in the month of Ramadan. I hate travelling while fasting, and to save myself the hassle of scouting for food on my arrival, I called my host on the phone and asked him to get some food ready for my fast. He was Christian. When I got into the neighborhood, I was unaware that the quarter was a ‘death zone’ for non-Christians. Chollom didn’t tell me. I only realised the danger when I stepped out to locate a mosque. The one I knew was no longer there – it might have been the burnt edifice I saw in its place. At once, I waved down an okada rider and asked him to take me to the bordering quarter, Nassarawa Gwong! He sized me up with wonder, shrugged and zoomed away. I had no clue. I stopped another. This rider smiled as one would at a known teaser. “I no dey go there o!” He blurted, without offering a reason. I made it to the border on foot, wondering as people poured to the street to watch me amble into the other ‘death zone’! I was unhappy with Chollom, but he said that he could never come to terms with the idea of not hosting me. That incident made me began to think about ways to solve such religious segregation. I discussed this with the poet Richard Ali when we met on that visit to Jos, offering what I considered a solution. Richard and I agreed on soon setting up an NGO aimed at fostering unity between people of divergent ethnic and religious differences. On the eve of my birthday this year, a Saturday, I was chatting with a Muslim friend, when I suggested that a way to end these growing attacks on places of worship might be a community security set-up where Muslims stand guard for Christians during church services and Christians for Muslims during Jummu’at prayers. He bought that. So I called a relative, Ahmad Ibrahim Gimba, and informed him about the plan. He too bought it, and immediately arranged with a friend of his to inform their priest of our mission. As early as 6 am on Sunday the 8th of January, my birthday, I was already up for the day’s task. I live in Tunga but the church, Saint Mary’s Catholic Church at Kpakungu, one of the largest churches in Minna, is familiar to me. Ahmad Ibrahim and I got there and were soon joined by our other friends who were very keen on the mission. Our Christian friend who worships in the church took us to the security guard to explain our mission. Before the 7:30 am service commenced we were already spread round the church: Awaal Gata, Shuaibu Usman, Dantani Usman, Danjuma Mohammed, Idris Lade, Mohammed Saba, Kabiru Mohammed, Aminu Umar… We were eighteen in all! After the service, there were some hitches. Policemen came around to know why Muslims would offer to guard a church. Even though we informed them that Ahmad had spoken to a member of the church and arranged that we would be coming, they were leery. The trouble with such system, I learnt a day later from a member of the church, Dominic Eigbegbea, is trust. Dominic is the president of the Catholic Youth Organisation of Nigeria (CYON), Minna Diocese. He was blunt, confiding in me that Christians don’t trust Muslims anymore, that whatever bound them together is handled with suspicion. He said that he discussed our arrangement with the other members of the church, and they cautioned that we shouldn’t be trusted, that we just want to infiltrate them, study everything about them and, when they are put at ease by our dubious gesture, launch an attack. Every Muslim is a terrorist, I gathered from their response. Yes, a burden, this weighs me down. I must carry this cross. Unlike Christ’s, though, my cross is the weight of a faith, the crescent, deconstructed by too many misperceptions, too many stereotypes, unwitting and deliberate. May God save us from us, Ameen. I am writing this post on 17 March 2012, but backdating it to the first of the year, for blog organization purposes. 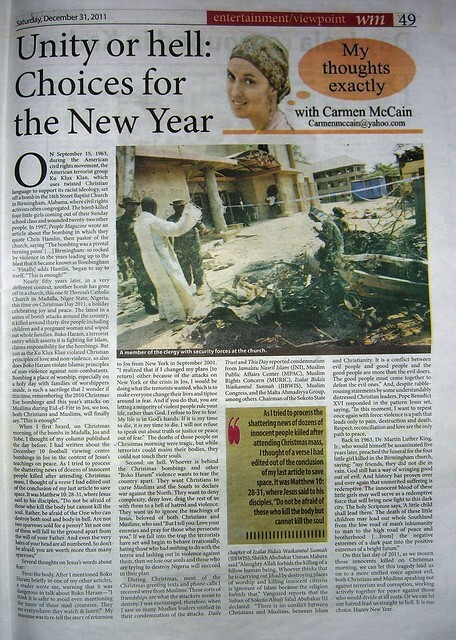 My column for the new year with the not so subtle title of ‘Unity or Hell: Choices for the New Year’ was published as usual in the Weekly Trust on New Year’s Eve 2011, republished in the Daily Trust on 2 January 2012 (on pages 25 and 26) and again in the Vanguard on January 12. I wrote this following the bloody events of Christmas Day 2011, which has (with hindsight) unfortunately ushered in the “year of the bomb” in Nigeria. I pray that, despite the tragedies that have occurred so far in 2012, that we can rally around to unify against those who would divide the country. To read the original, click on the photo below. To read on this blog with links to the passages, I quoted, scroll down below the photo. First: the body. After I mentioned Boko Haram briefly in one of my other articles, a reader wrote me, warning that it was dangerous to talk about Boko Haram—“I think it is safer to avoid even mentioning the name of these mad creatures. They are everywhere: they watch & listen.” My response was to re-tell the story of returning to Jos from New York in September 2001. “I realized that if I changed my plans [to return] either because of the attacks on New York or the crisis in Jos, I would be doing what the terrorists wanted, which is to make everyone change their lives and tiptoe around in fear. And if you do that, you are letting a minority of violent people rule your life, rather than God. I refuse to live in fear. My life is in God’s hands. If it is my time to die, it is my time to die. 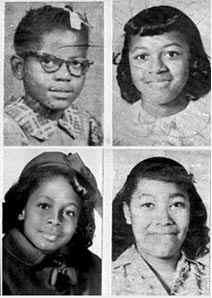 I will not refuse to speak out about truth or justice or peace out of fear.” The deaths of those people on Christmas morning were tragic, but while terrorists could maim their bodies, they could not touch their souls. Second: on hell. Whoever is behind the Christmas bombings and other “Boko Haram” violence wants to tear the country apart. They want Christians to curse Muslims and the South to declare war against the North. They want to deny complexity, deny love, drag the rest of us with them to a hell of hatred and violence. They want us to ignore the teachings of Jesus, beloved of both Christians and Muslims, who said “But I tell you: Love your enemies and pray for those who persecute you.” If we fall into the trap the terrorists have set and begin to behave irrationally, hating those who had nothing to do with the terror and lashing out in violence against them, then we lose our souls and those who are trying to destroy Nigeria will succeed in their plan. On this last day of 2011, as we mourn those innocents killed on Christmas morning, we can let this tragedy lead us on to a more unified voice against evil, both Christians and Muslims speaking out against terrorism and corruption, working actively together for peace against those who would divide at all costs. Or we can let our hatred lead us straight to hell. It is our choice. Happy New Year.